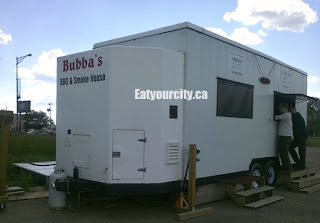 Eat Your City: Bubba's BBQ and Smokehouse Edmonton, AB- Deeply satisfying messy delicious smoked beef brisket happiness! 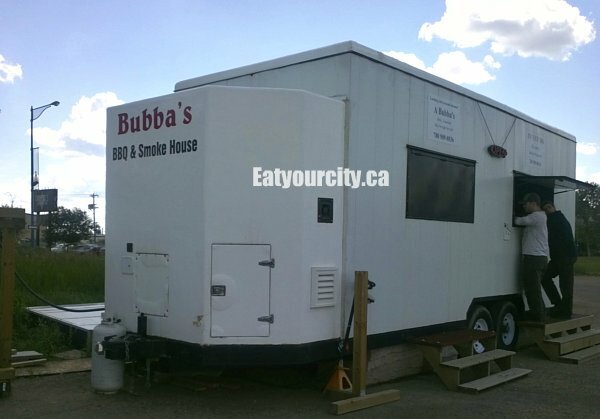 Bubba's BBQ and Smokehouse Edmonton, AB- Deeply satisfying messy delicious smoked beef brisket happiness! Having heard of Bubba's a while back when it was just starting out in its original location, finally got a chance to try their smokey goodness after all this time - and its not for a lack of trying!! first time we were foiled as the (original) location wasn't widely available online and we circled around before we gave up. Second time we came by around Thanksgiving and being a family guy, Bubba's was closed. Third time's the charm! We did zoom past its current location close to the southside Supestore and had to double back a little bit. 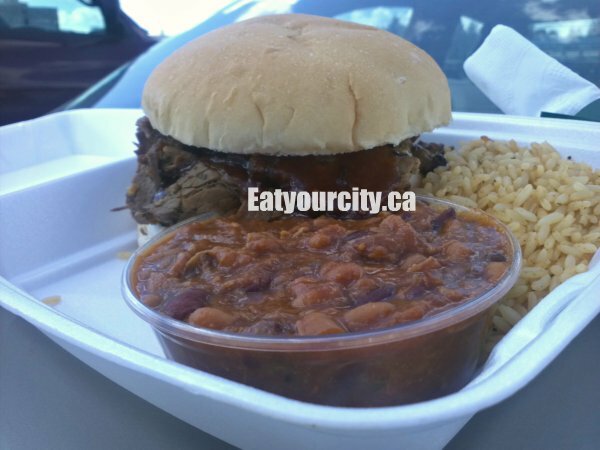 Look for the white boxy van parked in the parking dirt lot just south of Superstore, and make sure you bring cash so you can get some smokey BBQ goodness! The menu rotates daily, with rack of ribs, smoked chicken, pulled pork, beef brisket amongst the stars, and various bean and chili incarnations as sides. Rand "Bubba" Petersen is retired and it clearly shows he loves what he does and makes whatever he feels like smoking up expertly every weekday. Dal, our meat corespondent has raved about the ribs, but today, its smoked beef brisket on a bun with slow cooked beans. We must have lucked out as usually there's a big line up and if you show up late, just like Seinfield's soup nazi.. There will be no smoked meat for you!! 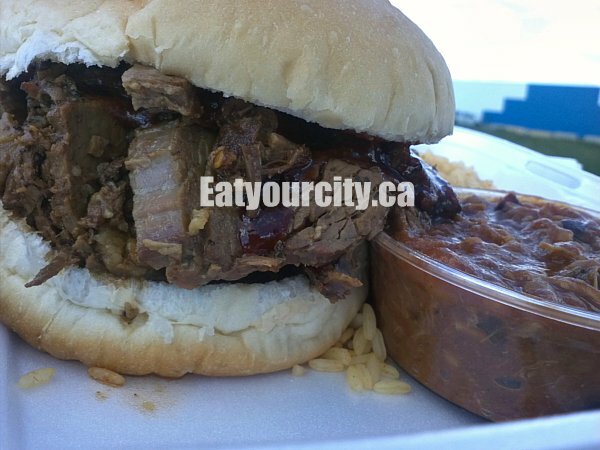 We had a bit of time to enjoy the summer sunshine waiting in line and snap a few pics as he piled a bun full of thickly sliced moist smoked beef brisket and slathered it with a healthy helping of his secret BBQ sauce in the back of his food truck. Add in a small bowl of baked beans loaded with pulled meat, plenty of napkins and $11 (remember to tip Bubba!) and we were heading back to the car with a styrofoam container of smokey happiness. 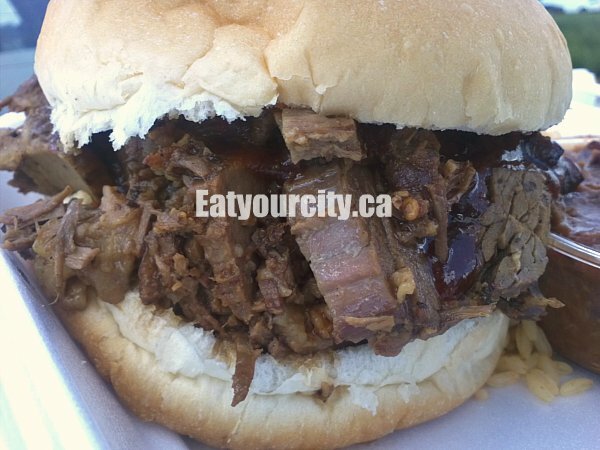 The bun served as a soft base to absorb some of the sweet and slightly tangy secret BBQ sauce as well as keep your hands (not really) free of saucey brisket. The brisket was thickly sliced, and lightly smoked to a tender moist melt in your mouth texture. The fattier bits added in an extra burst of juiciness as you bury you face into a happy messy delicious beef brisket sandwich. The exterior bits of the brisket was a bit on the dry side and had stronger notes of the surprisingly mild and almost delicate smoke flavor, and we noticed some smoke rings within the thicker pieces of meat just under the bark (the seasoned drier flavorful surface of the brisket). For anyone that has ever attempted to smoke meat that was moist and yet still develop smoke rings, you don't need me to tell you its an art and achievement to get the smoke ring as a result of slow even heat, smoke and a nod from Lady Luck. Its moist, tender,not overly salty, savory and just a right amount of smoke, and with Bubba's secret BBQ sauce... Win! Nomnomnom!!! The brisket sandwich was served with a side of lightly seasoned and spicy rice, as well as a slow cooked bowl of beans and pulled meat, resembling a pulled pork chili. Paired with the rice, this was huge meal guaranteed to fill up a hungry tummy!! We also liked that the BBQ sauce taste profile was quite different and more mellow than the seasonings used in the slowcooked beans. So despite having smokey elements in two out of three items, things didn't taste simular, but worked really well as separate elements as well as well.. 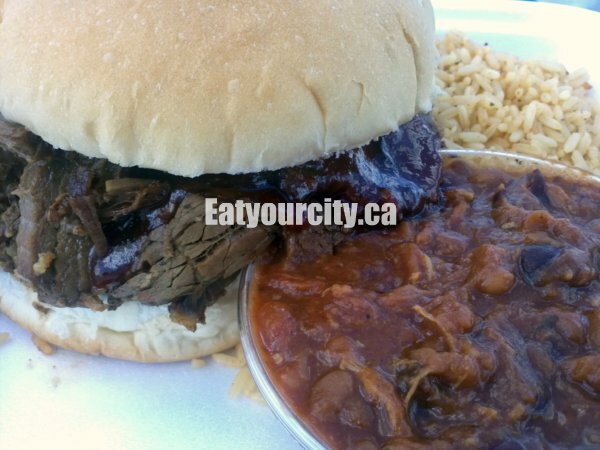 Mix it up any way you want... You're eating this awesome smoked meat meal in or on your car!! Lol... We ate it on our trunk! With his dedication to smoking delicious meats, its easy to tell that BBQ meats is Rand Peterson's passion and art. hope he continues to do this long into his retirement... And we'll definitely have to make time to come back for the smoked chicken, ribs and pulled pork!! !